In 2013, no new major petrochemical plant start-ups are expected in Thailand since it is already a petrochemical exporting country, according to Namsak Choonhajutha, Advisor of Plastic Industry Club - The Federation of Thai Industries. 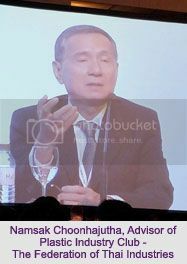 “Plus, there is also a lot of public concern over environmental issues caused by petrochemical production (in reference to public concern on the Map Ta Phut industrial zone where most of the petrochemical companies operate),” he added, speaking at ChemOrbis Asia’s annual meeting in Bangkok recently. Namsak also expects that this year the packaging sector growth of 4% “driven by slower private spending due to an increase in household debts.” The automotive and household appliance sectors are expected to see the highest growths of 10% respectively, mainly due to the increase in foreign investments. Meanwhile, demand for plastic medical devices is also expected to grow due to the increasing ageing population and the country’s positioning as an international medical hub.